It’s a fascinating industry nonetheless. The whole idea being to build valuable relationships with prospects & customers alike to increase awareness and improve profitability. Building a SaaS Business is not easy. Once you have the right product, it’s time to get customers and grow a profitable business. How do we do that? How can we launch our product? How can we acquire customers? How can we improve profitability? These are all questions that will be answered here. The aim is to create a resource of reference for everyone building a SaaS business. Enjoy! Ready to learn everything there is to know about SaaS Marketing? Please note that this guide is a Work in Progress. I’ll include more links in the future. I’d love to hear your feedback, so feel free to drop a comment at the end. In this part, the main idea is to make sure that you build the right product, for the right people, gather feedback and avoid Marketing too early in your process. Read on to avoid many mistakes at the beginning of your venture. Startups have limited resources. How do you build a product with limited time and money? How can you do marketing within these constraints? Wanna build a startup? The first thing you need to understand is that the Motto ‘If You Build It, They Will Come’ is BS. Customers should be at the center of your Marketing Strategy. You know what else should be? Your Product. Building the right product, for the right audience is primary to your success so pay attention to your Product / Market Fit. If people don’t love your product, you’ll never find sustainable growth. Spend your time and money on the product. Once you have a set of passionate fans, start the marketing spend. Still early in your development? 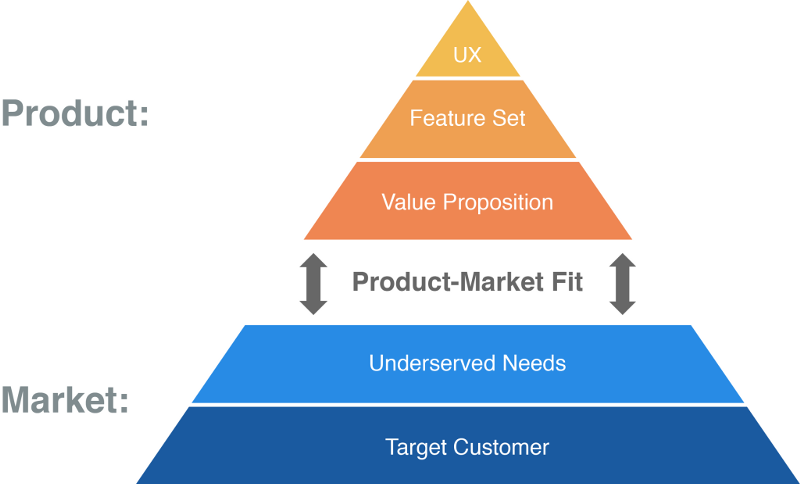 Follow the playbook to achieve Product / Market Fit. “Nothing kills a bad product faster than good advertising”. Product first. Marketing second. Don’t start Marketing too early as it could destroy your startup’s future. If you think that adding “just this one feature” will make people use your product. Pay attention to the Feature Fallacy. Make sure that you gather as much feedback as you can through the Build-Measure-Learn loop of the Lean Startup. Customer Development is at the intersection of many different subjects. It can be used to validate your ideas and design your Marketing Strategies. Most people will ignore your Marketing. They don’t wanna hear about your new products. Permission Marketing is now all about asking customers for their permission. Writing persuasive copy is primary if you want to convey your message and convert your visitors. SaaS Marketing is way different in nature than any other type of Marketing. Make sure you understand the differences to avoid a complete failure. SaaS is a different world… We have weird acronyms like ACV, ARPU, CAC or SLA. Having a glossary can come in handy. Growth Hacking is a term coined by Sean Ellis back in 2010. Although the term is under a lot of controversy, Marketing is evolving and you should evolve as well. Growth is all about launching experiments and investing in what works. It’s a specific mindset that you need to adopt in order to grow your business and impact your bottom line. Marketing is evolving and Andrew Chen goes as far as saying that Growth is replacing Marketing. All these principles can easily be implemented through a Growth Strategywhere you’ll identify the right growth levers and design your roadmap. Choosing the right model for your team is a tough question. To help you, have a look at how growth teams are structured in other companies. Growing a product? You need to select and understand the right Growth Engine for your specific business & product. Something amazing about Digital Products is that you can measure whatever you want. You can measure the engagement for a specific feature or attribute your revenue to specific campaigns. This section is about to give you everything you need to get started quickly with Analytics, design your own metrics for the good of your startup. You’re unsure about Data & Analytics? You need to understand that Data is the lifeblood of your business. Lean Analytics is a book that can help you to choose the right metric and launch experiments in order to improve this specific metric. If there is only one takeaway to the whole Lean Analytics book is that you should choose an OMTM (One Metric That Matters) and stick to it. Taking data-driven decisions could help you to reduce the guesswork in your decision making process. Analytics is primary to help you assess your Marketing’s effectiveness. You’ll have to find the right metrics for each of your Marketing Activities by designing a Measurement Plan. Did you plan your success? Make sure that you didn’t model your growth incorrectly. Your ARR / MRR are both very important metrics for you, so make sure that you calculate them accurately. After designing your metrics, you’re now ready choose the right software to support your Analytics Strategy by implementing an Analytics Stack. Google Analytics can be a complicated beast. Discover how to use it in this awesome guide where you’ll cover everything from implementation to analyzing your reports. You want to go even deeper into your analytics? Learn about Probabilistic Programming & Bayesian Methods. Wanna see what Analytics looks like for successful startups? Look at this article for Zynga, or this article for 500px. When building your Startup, it’s primary that you choose the right way to sell your product and capture value from your customer. Going for a monthly subscription isn’t always the way to go. Make sure that you designed the right model by asking the right questions. The best place to get started is to fill in the Business Model Canvas as a way to state all your hypothesis. SaaS isn’t only about Subscription. There are a lot of factors to take into consideration while going into this business model. As a SaaS business matures, more of its revenues come from long-term customers. Yet most SaaS marketers focus their time and resources on the customer acquisition. The longer you remain in business, the bigger the gap between net new sales and overall revenues, because more revenue comes from the recurring payments of your customer base. If marketing doesn’t mature to follow the revenue stream, it becomes less relevant to the overall business. Users & Seats rarely show value to your customers. So stop using Per-User Pricing because it’s killing your growth. Wanna see some examples of Pricing Strategies? Discover 12 Different SaaSy Pricing. Thinking about going freemium? Read this article about how to succeed (and how to fail). Freemium isn’t for everyone. Read how freemium nearly caused Baremetrics to implode. You’re now ready for show time? Launching a product is a long-mission that you need to get right. Don’t expect people to show up on your website. You need to build a strategy and an audience beforehand. The Press can be an incredible resource in order to drive more interest when you launch. Use this plan in order to get inside the news. You’re ready for showtime? Use Product Hunt in order to drive initial awareness. The Product Hunt Manual or The Ultimate Guide to Product Huntare both great resources. Wanna see what a successful launch looks like? Discover Slack’s story, the Dollar Shave Club or Hotjar. Sustainably getting people to your website in order to buy your product is at the foundation of most Marketing Strategies. From SEO to Paid, we got you covered! Since you’re a startup, you have limited resources. Both time & money are scarce, so you should go deep not wide and select a handful of channel to focus on. When you want to get started with Traffic Acquisition, it’s primary that you generate hypothesis regarding your channels. To do so, you can use the Bullseye Framework. After testing & iterating on your channels, you can create a Customer Acquisition Strategy to make sure your efforts are efficient. Writing quality articles aimed at your audience can drive an incredible amount of traffic to your website. To get started, read the Beginner’s Guide to Content Marketing. Now that you know a little about Content Marketing, it’s time to build your Content Strategy. Writing is only the first step to your content strategy. Once you hit publish, don’t sit tight. Start distributing your content. Guest Blogging can allow you to reach a wider audience. You can have a big impact if you write high-quality article on big blogs within your industry. Read The Definitive Guide to Guest Blogging. The problem I have seen with various SaaS Companies is that they spend a lot on promoting their product and acquire fewer right customers. To avoid this, it is very important to promote the product to the right audience. (Check out HubSpot’s template – on building customer persona). If Companies can create Buyer Persona – it would super easy for the marketing team to really understand the pain points of customers, their preference, where they spend more time online and come up with marketing & content plan that will attract the right customers. You can literally save thousands of dollars on content creation or paid advertisement by just knowing their real pain points & where (platform) they engaged the most. SEO can account for more than 70% of your Traffic. Don’t miss out on this opportunity to bring in interested visitors (for free). Read on The Beginners Guide to SEO. To do well in SEO, you need to understand what Search Engines are looking for. The infographic below can come in handy or look at Moz’s Search Engines Ranking Factors. Nailing your on-page SEO is one of the many factors that you need to consider in order to rank well on Search Engines. Links are still a very important factors to search engines to create authority. Make sure you read The Beginners Guide to Link Building. Links aren’t created equal, so make sure you understand what factors are important when assessing link value. Email is definitely a channel that can help you to reach your leads & customers. Increase your efficiency thanks to these 20 Tips for Dramatically Better Emails. Emails isn’t only a channel to communicate with your customers. You could also build a list of interested prospect with these 17 tactics to grow your email list. Marketing is evolving. So is Email Marketing. Discover these 7 Little Known Techniques to generate better results. Wanna use outbound sales emails? Read The Ultimate Guide to Sales Emails. Paid Acquisition can enable you to add fuel to the fire. Wanna get started? Read this beginner guide to PPC. Marketing and Sales teams have two goals: Create more leads and close contracts. Often stakeholders have different opinions on what direction to take to achieve these results. What I have found is that while there are healthy tools in any marketing portfolio (PPC, SEO, Content Marketing, affiliates) generally no one knows what path will work best for a given product. The best way is to test several different campaigns and versions of each. You will then start to get an idea of what campaigns are succeeding and failing. It will also give you a better snapshot of what your Cost of Customer acquisition will be. People are looking for your product on Google? You don’t want to wait before you can improve your SEO? Get on AdWords. AdWords is too expensive for you? Optimize your campaigns with this ultimate checklist. Social Media is a field of it’s own… To know more, Social Media Examiner already gathered 40+ resources for you. You’re in B2B? Social Media can also help you to reach your consumers. Don’t miss out on this huge potential. Getting people on your website is amazing. However, if these people aren’t converting, you’re just wasting money on Traffic Acquisition. How can you convert these people? How can you improve your conversion rates? Master the Essentials of Conversion Optimization in order to improve your conversion rates and grow your business efficiently. The best way to boost trial signups is to take the words out of your customer’s mouth. Find out why people love your product and use that exact language on your home page. When someone visits your website and it’s “speaking” to them, they’re much more likely to sign up. You probably have a lot of CTAs asking for Macro-Conversion (e.g. Sign Up, Purchase). However, never forget about Micro-Conversions which are equally important. If your micro-conversions are limited to “Subscribe to our mailing list”, you are missing out on killer bribes to grow your email list and engage your prospects. When people reach your email list, it’s the perfect time to show them value and move them through your funnel by designing a lead nurturing strategy. You’re having demos with your customers? It shouldn’t be all about your product… Make sure to read The Ultimate Product Demo Guide. When people get to your product, it’s primary that you engage them through your onboarding. Killer onboarding starts with a story, not your product. Understanding your users is primary to your succes while improving your onboarding. You need to understand their aha-moments to have the maximum impact. Improving your Onboarding then comes through a process of experimentation. You have a Free Trial? Join this free email course to improve your conversion rates and grow your business. We test emails to maximize our conversion rates and deliver the best returns on our emails. For example, we launch a sale on yearly plans once a year. We send out several emails about the sale, and we test each one by sending 2 or more versions of the same email to a small sample size. The version that gets the most upgrades is then sent to the remaining users out of our total of 2 million. We do this so that we do not bombard all of our users with an email that doesn’t get the results that we could’ve gotten if we had tested our subject line, copy, and design. Wanna build an healthy business? Retention is key. Properly retaining customers will allow you to finally enter deep sleep at night. Retention is primary to your business. Understand this difficult concept with Brian Balfour’s intervention at WMD2015. Lincoln Murphy argues that Churn is impacted by early-engagement with your company especially during the sales and onboarding process. Retaining your customers is one way to create a healthy business. However, developing Negative Churn can be very powerful. Using Customer Success is at the foundation of improving your retention. The whole idea being to understand “How can we make our customers successful with our product?”. Lincoln Murphy wrote a lot of in-depth resources and created the SaaS Churn and Customer Retention Resource Guide. Customer Success isn’t about improving retention, account expansion, or customer advocacy. Customer Success is about ensuring your customers achieve their Desired Outcome. Retention, Expansion, and Advocacy are the result of that focus. This isn’t semantics; keeping their Desired Outcome in mind will ensure you operationalize around making the customer successful and not just avoiding churn (save ’em) or driving retention (get that renewal). Want to see how others are dealing with Retention? Look at these success stories by Intercom, HelpScout and Baremetrics. It’s not because you’re a young startup that you shouldn’t care about your Branding. You’re probably not going to run Branded Advertising, but Branding still matters, even in B2B. Not sure your Branding is important? Branding is the black horse of startups. Branding isn’t only about having a nice logo. It’s about the entire experience that people have with you. Founders should always do these three moves to build a brand that matters. Your branding should personify your company’s core values and unique selling point. If being innovative is what sets you apart, then your branding should communicate that in every interaction, be it through your website’s design, your blog’s tone, the message of your advertising campaigns, your customer emails, or any type of communication. Customer’s Perception are a huge part of how you want to position your brand. Make sure to use the right tone and language to delight them. Wanna know more about Branding? Read The Startup Branding Funnel or Lean Branding. You’ve come a long way… If you read most of the resources included here, you’re now a brillant Marketer. What’s next? Experiment with your product and grow the heck out of it! Want to Build your Growth Machine?!! !